Sabudana Khichadi is the most popular Indian snack during fasting. But I like it so much that I make it very often. I have added cashews with roasted peanuts for rich taste. 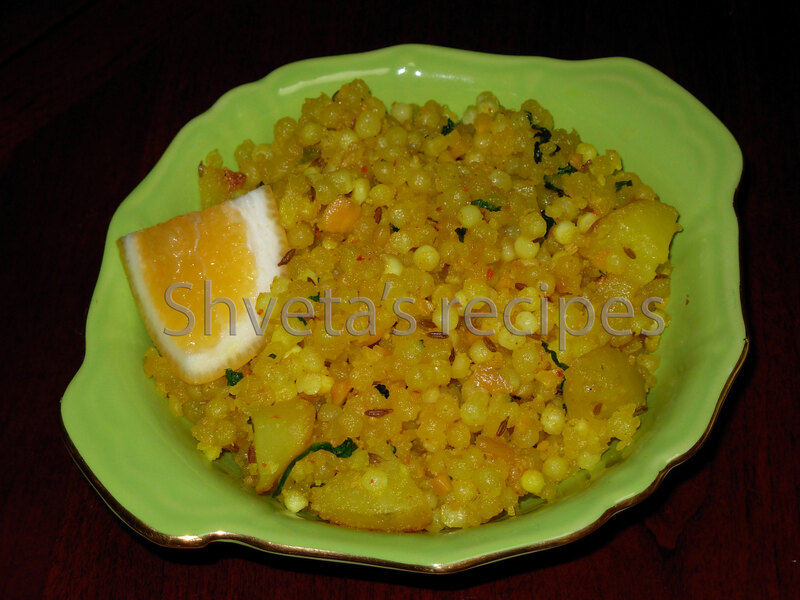 Hope you like my version of Sabudana khichadi. Soak sabudana in just enough water to cover it. Let it stand overnight. In the morning, the sabudana looks nice and fluffy. Peel and cut potatoes in small cubes. Finely chop green chilies and cilantro and keep aside. Coarsely grind roasted peanuts and cashews and keep aside. In a bowl mix, Sabudana with roasted and crushed nuts. Heat 1 tbsp cooking oil in a pan. Add cumin seeds; let it crackle for 1 minute. Add asafoetida powder and chopped green chilies to it. Add the sabudana mixture to the pan. Mix well. Keep the heat medium and stir occasionally. Add red chili powder, salt, sugar and lime juice to it. Cook for few more seconds. Do not add water to the khichadi at any point. It will make it lumpy. Garnish sabudana khichadi with freshly chopped cilantro and some lime juice. Enjoy hot with a cup of tea or coffee. Note: If you are making Sabudana khichadi for fasting menu, do not add Turmeric powder.